1995-2001. Acrylic on stretched canvas. 24"x36". According to ancient Greek mythology, Orion was the giant son of Neptune and the greatest hunter the world had ever known. 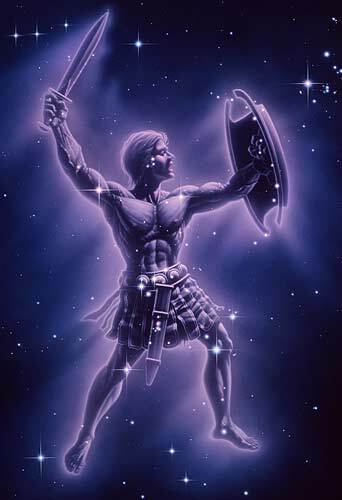 After being slain by Scorpius (the scorpion), the legendary warrior was placed in the heavens and is represented by the brilliant constellation which bears his name. Although his figure is imaginary, the bright stars of Orion have been depicted in their proper positions, brightnesses and colors.